In the middle of Autumn, I want to find something delightful, easy-to-love and cozy that makes my day livelier and heat me up. 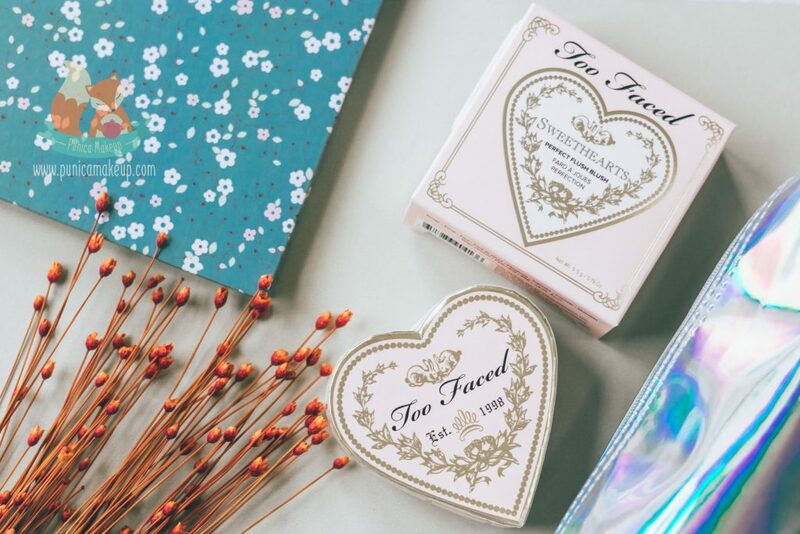 Bet that Too Faced has been tremendously familiar with us, for me, the Sweet Peach Eyeshadow Palette used to be a big addiction. Now, I’m picking up a cutie from the brand, she is small, delicate and full of love. This post is about frankly reviewing the Too Faced Sweethearts Perfect Flush Blush in Candy Glow. The product seems visibly affectionate to lift up our mood from the packaging design to how it sits on our skin. Many of us have experienced it already, the good and bad are unquestionably unavoidable. I did miss the chance to get my hands on it at the first place in the Spring, 2013. So, feel free to be open and share your own feelings about the blush with me, dollies! 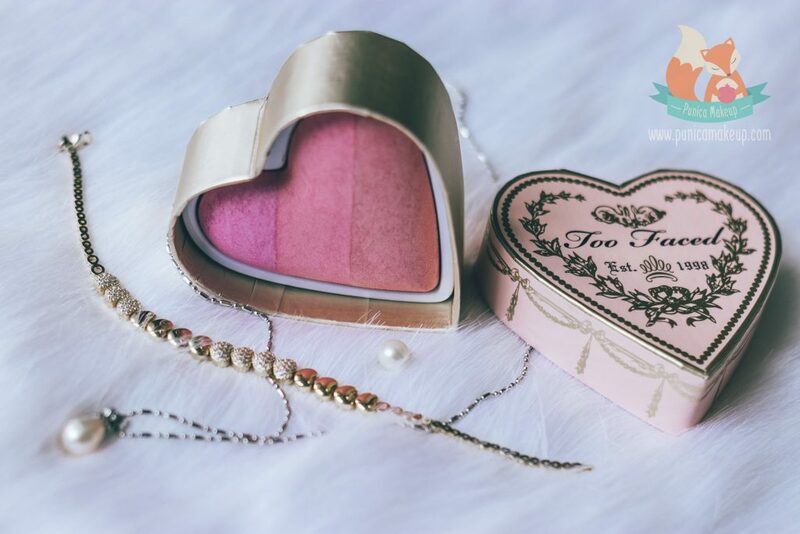 In addition to the Candy Glow, obviously, the Too Faced Sweethearts Perfect Flush Blush provides two other options, named Sparkling Bellini and Peach Beach. 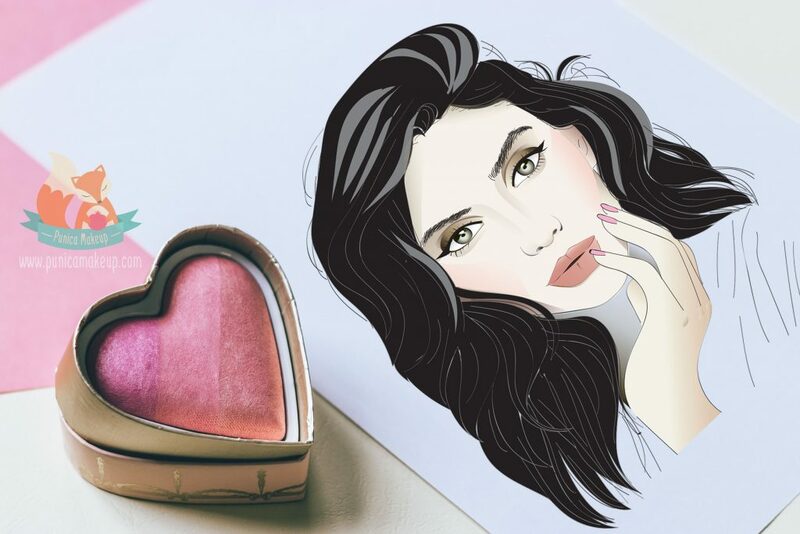 Each of them similarly consists of triple color swatches housed in the baked, heart shaped blush. This is meant to dimensionally highlight your cheeks with iridescent sheen by blending three parts together for a custom flush. It tends to brighten up your complexion with a shimmery finish for a youthful, peppy appearance. Otherwise, you can utilize the colors individually as your coveted results. Sounds curious and dreamy, isn’t it? I’m here to figure out whether or not it’s gonna make the cut. The Candy Glow offers three hues that are rose, coral and peach from the left to the right. Moreover, the product promises to be very buildable and wearable onto the most of skin tones. One of my most favourite is it’s vegan, cruelty-free and paraben-free. Infused by lots of chemical active compounds as emulsifying and conditioning agents which are certified to be non-harmful and friendly. They function to improve the blush’s texture upon skin. Also, formulated with mineral pigmentation, including Tin Oxide and Titanium Dioxide as well as synthetic dyes labeled “lake” mostly made of coal tar and petroleum. So, the shade I picked here is Candy Glow, which is indeed prone to pink concept. In contrast, the Sparkling Bellini and Peach Beach are about berry and bronze respectively. Gotta say the blush is really nice and dessert-like, provides three sweet, delectable colors. They’re flat-out baked with marbled effect on the surface to leave undeniably smooth texture and mild luminosity, reflecting the soft light upon my cheeks. The coverage is absolutely lightweight without streaks, clumping or patchy residues when blending. Well, I feel sorry that the company doesn’t put them in the same size. The rosy pink seems to kick off our work with cool undertones. This is coolest one and gives a pearly finish. It’s literally gliding onto skin and delivers multiple flecks of shimmer. I think it’s sufficiently buildable and has a fairly good color pay off that you may need to sweep over by a couple of times. That’s gonna bring about extremely light coverage. Easy to apply and very blendable in spite of doing many layers on top. The color is genuinely elegant and ethereal. Next, we have a coral pink in the middle with the hint of peachy, warm tones and being less sparkling than the rests of the shades. It’s like having more matte side and slightly dusty tho. Unfortunately, the shade is what I’m most skeptical and disappointed about. The consistency doesn’t evenly lay down onto skin; the problem is its’ poor pigmentation, which is very stubborn and hard to utterly pick up by fingertips or makeup brush. This tends to sheer out, then I gotta put more effort and keep rebuilding. However, this one occupies a pretty big part, such a waste. Finally, a peachy pink shade is here, intensifies the orangey undertones in the heart blush and provides beautifully frosted, icy sheen. 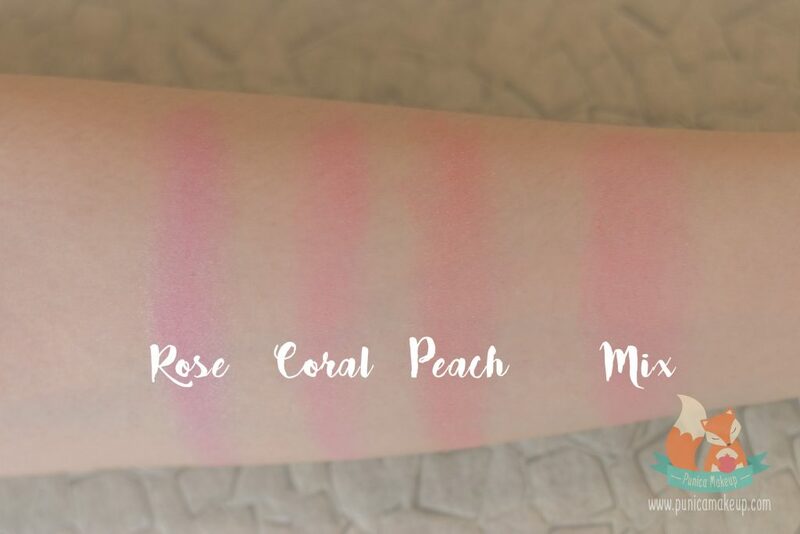 It really delivers a velvety texture and gorgeous pigment. Moreover, the shade is certainly blendable and buildable on my skin. This is one of the most worth-having about the blush. It helps to neutralize the cool shades for a warm, universal flush rather than merely pink color. I prefer swirling and mixing three shades together to achieve adorable, sheer to medium apricot pink. My skin is pale and a type of combination, prone to dry with lots of redness around my cheeks. Instead of bringing out the odd redness, the product is inclined to make my complexion healthier and more human being as well as necessarily gain radiance. Thank Goodness, it doesn’t settle into the pores or fine lines. The way the company designs the blush is really clever and impressive from the cool to warm shades next to each other. That makes you an artist and creates your own blushes. I can get more pink or peach whenever I want. Just wish to have a same size for each. Highly recommend the blush to pale, fair and light to medium skin tones. It tends to be vibrant and brilliant. Otherwise, regard to the darker, sadly, it may turn out being off and dull. The product is on the way to be gentle, slight and subtle once you apply onto skin. So, for those who have a medium to dark skin tones, Sparkling Bellini or Peach Beach will be your go-to, ladies! Unlike the Too Faced Sweet Peach Eyeshadow Palette, the blush doesn’t have a particularly pleasant scent at all. It rather has an obnoxious smell I can say. Additionally, the product is kinda long-lasting for 6-7 hours. The product comes into a small, neat compact, which is made of pasteboard, stiff paper. The lid is covered with pale pink hue having golden decoration, whereas the lower part goes with shiny, golden wrap. I think the packaging is charming and vintage, it looks like a appealing Christmas gift to someone you love. Otherwise, I don’t like much about the cardboard box containing the makeup product. 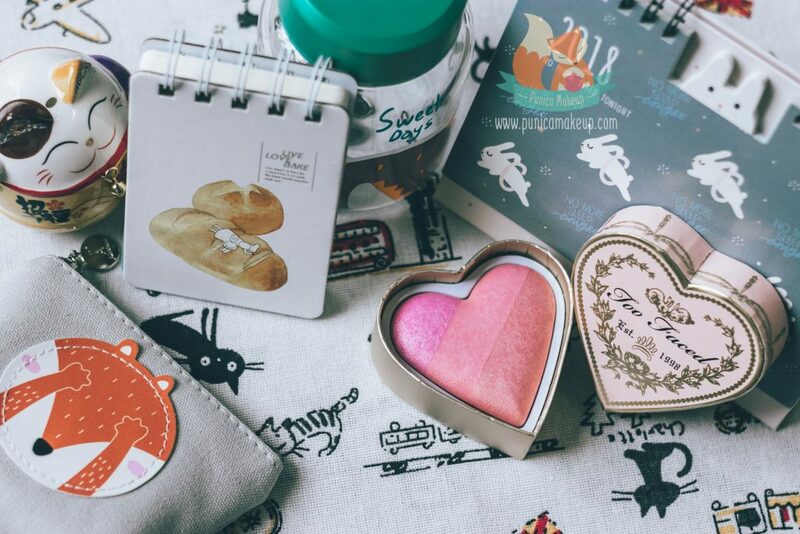 It may be better if nestle the blush into a resilient tin less likely to get dirty and able to prevent bacteria, dust or pollution sneaking inside. I mean that could be a easier and safer to embrace the blush longevity. Overall, the product is endearing and pleasurable, but not very outstanding tho. The single shades seem alright, except for the coral pink in the centre. I hope the company somehow put more work into it. Then, I give it 7 out of 10. 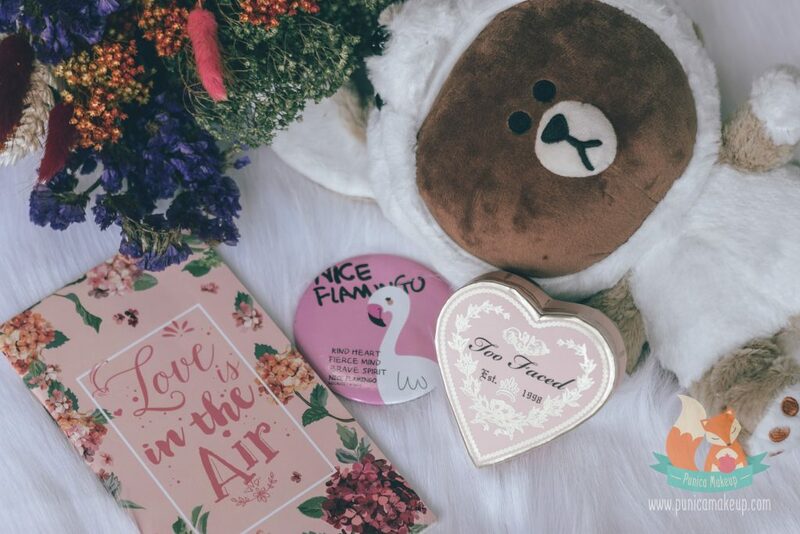 Hope the review is useful and helpful enough to let us get a comprehensive information about the Too Faced Sweethearts Perfect Flush Blush in Candy Glow. If you have any ideas or questions, please be open and share with me. I’m grateful for that. Thank you so much for being a part of this.